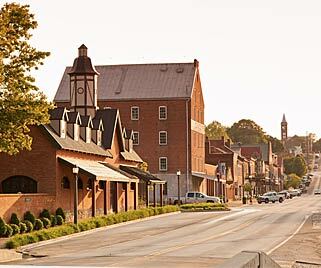 The German Settlement Society of Philadelphia settled in the town of Hermann, Missouri in 1837. Drawn to the Missouri River and the picturesque hills, reminiscent of the Rhine River valley, their goal was to create a German homeland in the west where life could be “in all ways German”. The German pioneers quickly turned to their heritage of wine making which was well suited to the terrain and climate. By 1850, most of Hermann’s 930 residents were involved with the growing wine industry, where over ten thousand gallons of wine were produced annually. In the 1800’s, neighbors and friends frequently gathered and traveled house to house enjoying wine, food and music of the region. The Golden Age of the small house winery had arrived by 1865 with wine production prevalent throughout the city and county. By the 1870 census, two hundred thousand gallons of wine were produced in Gasconade County. East Hill played a prominent role in the house winery industry and is featured in Robyn’s 1869 “Birds-Eye View of Hermann” where the house wineries are shown surrounded by grape vineyards and fruit orchards. 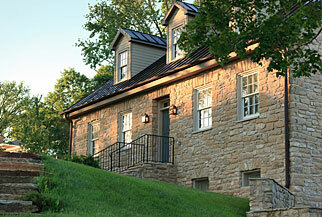 Enjoy your stay in one of the stone houses of East Hill, a one of a kind experience. 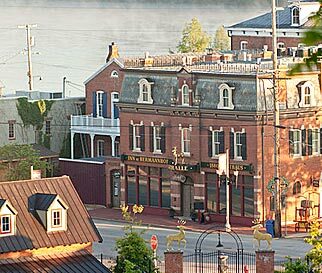 Located in the heart of the Hermann historic district, a stay at our Hermann MO Bed and Breakfast places you in the center of Hermann activities. 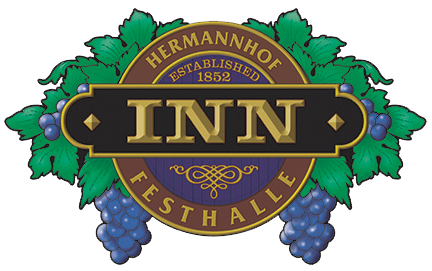 The Festhalle on the first floor is home to the finest Hermann festival activities and special events. Hermannhof Winery is a short stroll down First Street. Conveniently located at the corner of First and Gutenberg, the Missouri River to the north and the Amtrak station less than a block away connect you to the oldest and the most modern transportation systems. Originally the site of an 1869 building destroyed by fire in 1886, the building was reconstructed yet that year in the latest Second Empire style to house the Monnig store, a hardware, mercantile, pharmacy and post office all in one, with the upper floors the home of its prominent proprietor. 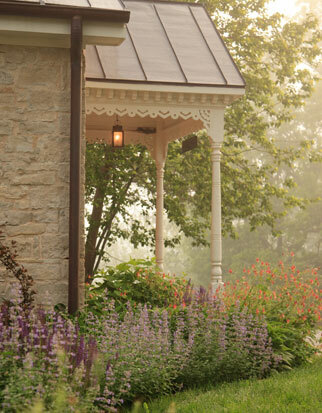 In 2007 the total restoration of the building was completed for our Hermann Bed and Breakfast. Originally built by Joseph Weinert following his purchase of the land in 1865, this stone house is clearly visible in Robyn’s 1869 “Birds Eye View” of Hermann surrounded by vineyards and orchards. Records indicate the land was purchased for $125 and sold at Joseph’s death in 1882 for $1150. Subsequently owned by the Freund family from 1882 to 1910, Professor Gustave Freund was well regarded in Hermann, having “identified himself most favorably with the educational interests of this county.” Gustave and his wife Charlotte lived in this house while he taught in Hermann. During the Civil war, Gustave enlisted in Union Army Company D, Second Regiment, Missouri Volunteer Infantry, and with his regiment took part in the Seige of Corinth, Mississippi. In 1923 Eustachiuss Weber and wife Teresa (Will) Weber bought this property. Teresa’s uncle, Magnus, was responsible for the construction of the arched stone bridge that once crossed Frene Creek in front of the Hermannhof Winery. This bridge is depicted in a historic photograph at the winery. The Weber family owned the house until 1960 or nearly 50 years. Clara and Dora, two sisters that never married, lived in the house for all that time. Built circa 1850 by Anton Grass, a successful farmer who immigrated from Switzerland. According to the 1860 census, Mr. Grass produced 220 gallons of wine and employed a hired hand as a wine dresser. 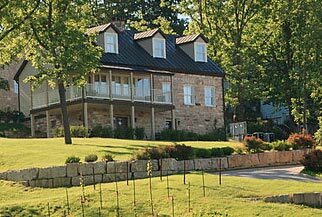 His estate listed 2050 pounds of grapes among his assets in 1880.This stone house has been carefully relocated from its original site five miles south on Frene Creek Road. Marking individual stones at the corners of the house and at windows and door openings insured the thoughtful reconstruction on its new site. Beautiful interior mahogany doors feature raised diamond panels in the German Biedermeier tradition. 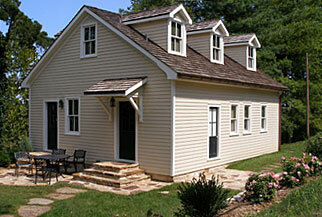 A historic house (Circa 1840), the stone for this unique structure came from a house built on land granted to the family of the first male child born in Hermann. The child was appropriately named Herman. This historic stone haus was recreated, and the original brick house is still standing on Highway 100 West. 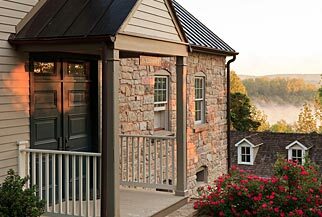 Relocated from its original site south of Hermann, this stone house was carefully reconstructed using exacting measurements and photographic documentation. Plastered walls with arched window and door openings capture the feel of the original 1840s stone house, typical of the rural house wineries surrounding Hermann. 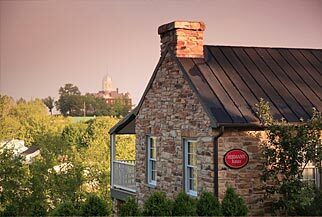 This home was an original “wine trail’ of the 1840 and saw many parties and events in it’s day. Neighbors and friends frequently gathered and traveled house to house, enjoying wine, food and music of the region. One of the first two babies born in the settlement was Karl Hoehn. Built by Johannes Blust in the 1840’s, one of the original German Settlement Society members, who was granted his lot in 1838. Originally a carpenter from Württemberg, Germany, Blust became a winemaker. The Blust Haus is one of the earliest houses in Hermann. It has been restored on its original site. In 1859, Blust and his neighbor, John Miche, were allowed the grand sum of $5.00 by the town of Hermann to build the Himmelstreppe, or “Stairway to Heaven,” on the step slope that would have been Franklin Street. This stairway is still used today.